‘A man’s best friend is his dog’, but few people take the time to find out about or go and see their close cousins- Painted Dogs also known as African Wild Dogs. I went to Zimbabwe to see them and had a wonderful holiday that exceeded all expectations. June 7th. 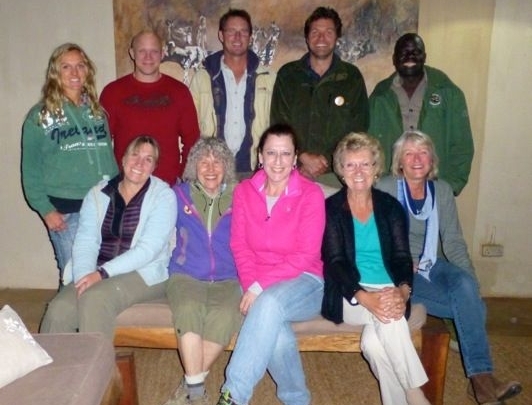 A small party of wildlife and dog enthusiasts from the UK & US met at London Heathrow to embark on a ‘wild card’ safari. We were heading off to Zimbabwe in the company of TV wildlife presenter & international vet Steve Leonard and Liz Drake our safari co-ordinator, to see endangered Painted Dogs and to learn about their physiology and the conservation work of their benefactors – Painted Dog Conservation – PDC and Painted Dog Research Trust – PDRT. We had signed up for a very unique and special joint-venture PDC safari. 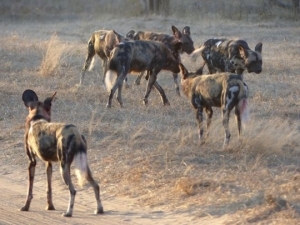 African wild dogs ranged across Africa, with 500,000 dogs in 39 countries, but over time they have been reduced by human interaction to around 5,000 through poaching, road kills and destruction of habitat. 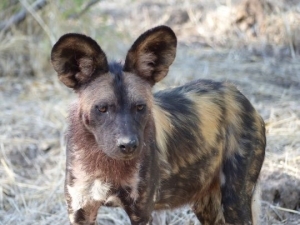 They are now an endangered species and Zimbabwe, where Painted Dog Conservation is headquartered, is one of the last strongholds. June 8th. 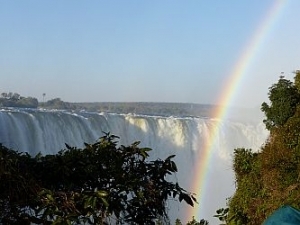 We arrived at Victoria Falls – one of the Seven Natural Wonders of the World. 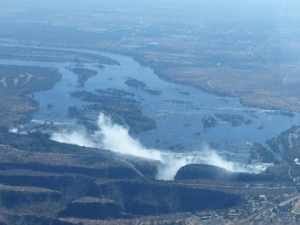 The Zambezi was in full flow and poured over the Falls. It was the perfect time of the year to see and hear ‘the smoke that thunders’ at its best and multiple rainbows in the mist. That evening we sat sipping sundowners overlooking a waterhole from the terrace of our lodge, with an air of confidence that we were going to have a trip of a lifetime. June 9th Our two small Cessna aircraft were the only planes at Victoria Falls airport. We took off and flew over the Falls – nothing can prepare you for the magnitude of this natural spectacle or describe the wow factor. We veered off over Lake Kariba and in to the African bush. 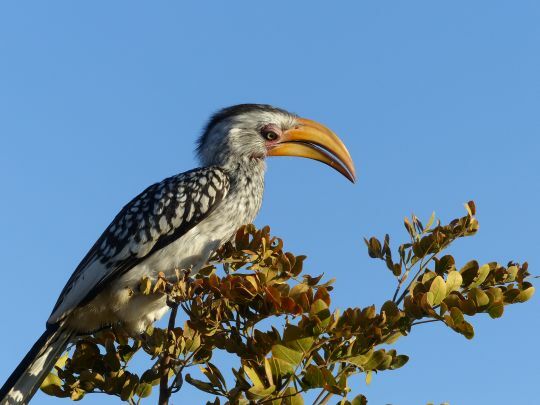 As we approached the small airstrip in Mana Pools a distinguishable figure stood waving at us. There was no doubt that this was the Dr Greg Rasmussen. Finally we were to meet this famous character who has been studying Painted Dogs for 25 years. 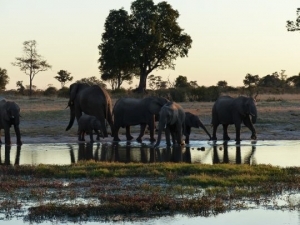 He founded PDC, which is now well established in Hwange National Park. Today Greg is channelling all his energy and knowledge in to Painted Dog Research Trust – PDRT, which will fund and train a new generation of young Zimbabwean students to continue his work with Painted dogs along the Zambezi Valley. 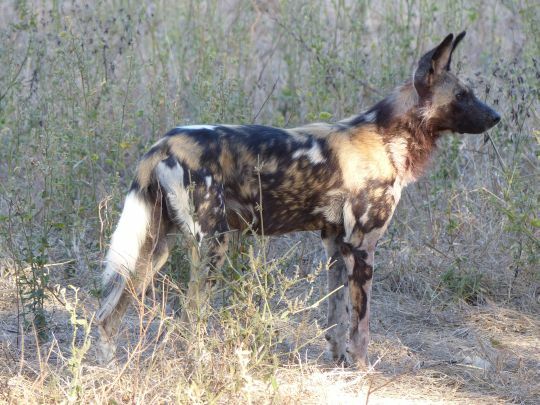 Greg’s passion for the Painted Dogs is highly infectious. We were in for 3 very full-on and exciting days with this legendary canid specialist, who spends as much time as possible in the bush with ‘his’ dogs. June 10th, 11th & 12th. 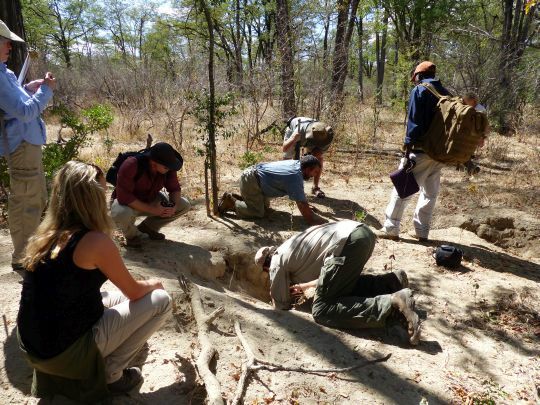 We spent 3 days with Greg and his right-hand man – MK, checking the dens of the Vundu pack and tracking the dogs. They had not been seen for a few days and it was feared that the alpha female may have gone underground to have her pups, which would mean finding the pack would be difficult. 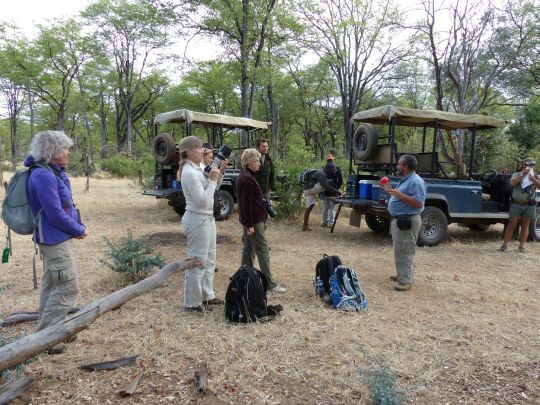 We tracked on foot with 3 armed guards – necessary as we were walking within yards of buffalo and elephant, as well as scouting in 4×4 safari vehicles. We located 6 dens and it was clear that the alpha female had not yet denned. We helped Greg collect data on the den entrance sizes (wildlife vet Steve Leonard volunteered to haul himself down in to the dens to do the deed!) and track the dogs looking for fresh poo (very pungent) and paw marks. Early on the 12th June bingo – we found the pack. We sat and watched and filmed 14 dogs greet each other, play boisterously and take power naps. This was a dream come true. There were in good condition and enjoying a happy day together. 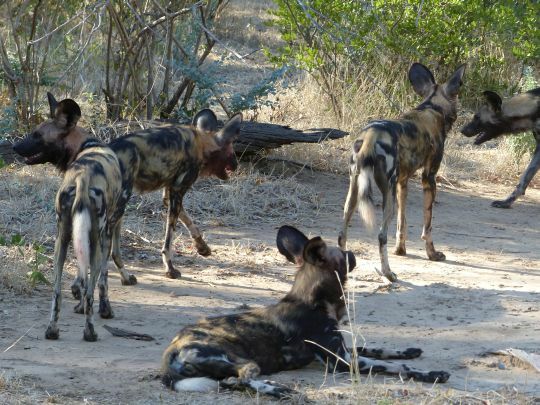 Contrary to perceptions Painted dogs are beautiful and their behaviour is very similar to domesticated dogs– chasing and playing with each other, much tail wagging, licking each other and cuddling up to each other. There were bursts of activity followed by bouts of slumber. In all we spent 6 blissful hours observing the pack at very close proximity. Without startling the dogs we could get out of the vehicles to sit and observe less than 10 feet away. It was hard to imagine such a congenial pack was also a top predator. 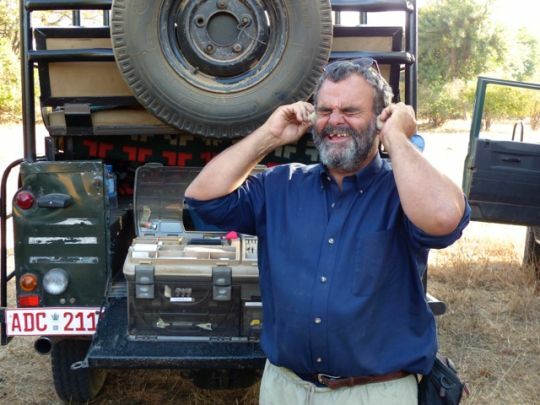 During their sleeping periods we gathered around one of the vehicles and listened to Greg explain how he conducts his research, collars some dogs and administers basic first aid when necessary. 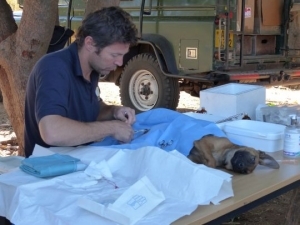 Our vet, Steve Leonard went through Greg’s procedures and medical supplies and explained the physiology of the dogs and the best treatment methods – all very fascinating. By our final evening in Mana Pools we were all one hundred percent converts and will no doubt be ambassadors of Painted Dogs. We had seen how incredibly social they are and how they live in carefully organized packs of 10 – 20 members, with each dog allocated a specified job. Painted dogs uniquely care for their sick and old. A dog that is innocently trapped and killed in a snare (used for other bush meat), has a profound and traumatic impact on the remaining dogs in the pack. June 13th. Time to reboard our planes and head off to Hwange National Park. Peter Blinston, Director of PDC, was there to meet us and ready to immerse us in to another part of the jigsaw of PDC’s fully comprehensive conservation model. 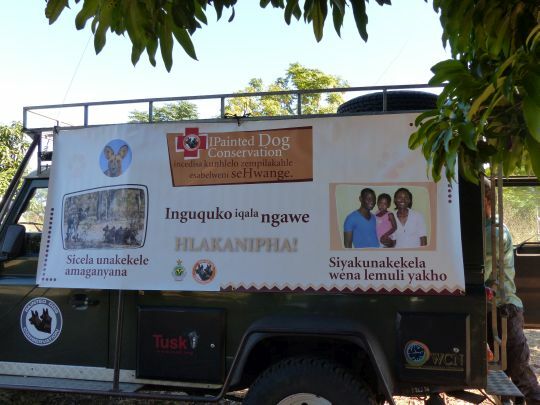 PDC works closely with local communities providing income from other sources (using snares to make crafts), developing an appreciation for wild dogs and the value of conservation through children’s bush camps and offering free vaccinations against distemper and rabies for domesticated dogs. 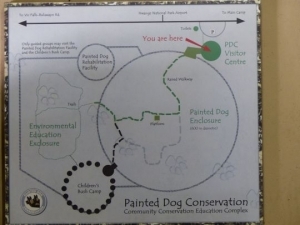 They also have an informative and well-presented visitor centre, anti-poaching patrols and rehabilitation centre for rescued and translocation programmes. After a quick lunch and freshen up we heading off to the craft centre to see one of PDC’s self-help community initiatives. 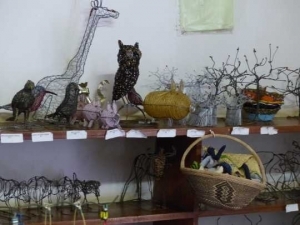 Snares recovered from their anti-poaching patrols are reused and remodelled into art and craft items for sale at the Iganyana Arts & Crafts Centre. The overheads are minimal and the end products are beneficial to the dogs, PDC and the local craftsmen. It is a successful and impressive sustainable conservation initiative. 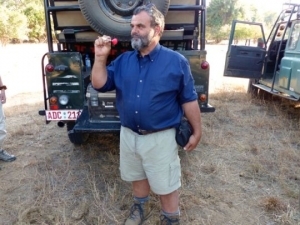 We then met the charismatic Jealous, a local Zimbawean who has been working at PDC for many years and is now one of their leading ambassadors, before heading off to see if we could locate the Makwa Pack. Through the radio collars it was known they had denned on private (unprotected) land outside the park and so finding them would only be possible when they were out hunting or away from the den. Jealous took some of the party towards the den site to check on any activity, whilst the rest of us headed off into the park to an area where the dogs could be found hunting. 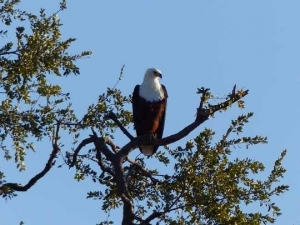 We watched the sunset over an idyllic waterhole where elephants and zebra wandered down for a drink and an African fish eagle presided, and we caught a fleeting glimpse of one dog as dusk descended upon us. June 14th & 15th. Over the next two days we spent time looking for dogs and other wildlife in Hwange National Park, encountering many elephants, giraffe, zebra, buffalo, kudu etc . We tracked on foot picking up the signal of the collared dogs in the Makwa pack and were rewarded with seeing them trotting down the path on several occasions. 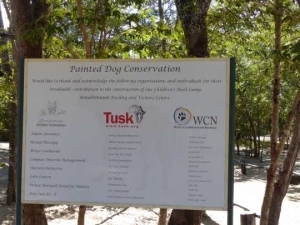 Interspersed with game drives we visited PDC ‘s HQ and saw the fabulous facilities they have established and met many of the staff working there – all committed to the sustainable conservation of Painted Dogs and proud of their jobs. Peter is the driving force behind PDC. 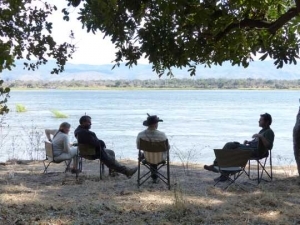 The achievements made and maintained, and new iniatives are truly outstanding and hugely commendable – from the rehabilitation centre, to the informative visitor centre displays, and the children’s bush camp. 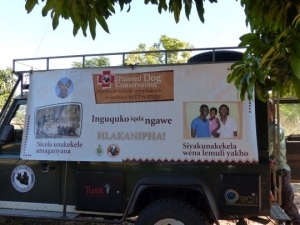 PDC has a large number of staff including teachers and other school helpers, poaching patrollers and veterinary nurses, and provides a regular income and housing for them. 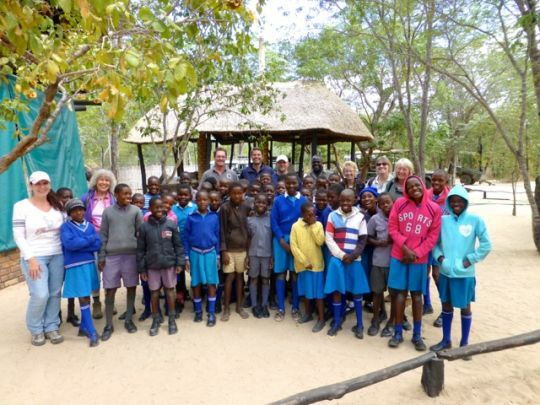 Our visit had been co-ordinated so that we could witness the end of one of the children’s bush camps. PDC runs 21 camps every year. 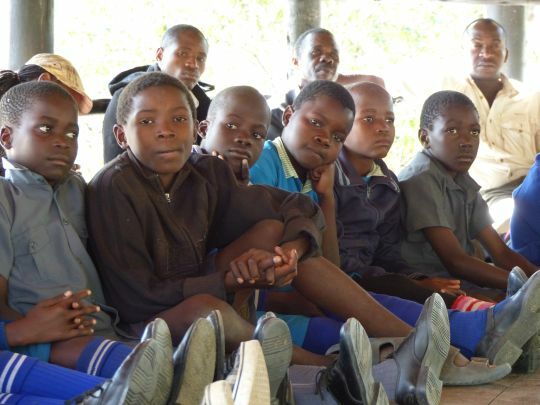 They are for 45 children aged 10 – 12 years from village schools within the catchment area of Hwange National Park. With their teacher, they spend 3 nights/4 days in the camp, learning about Pained Dogs and conservation of their environment. 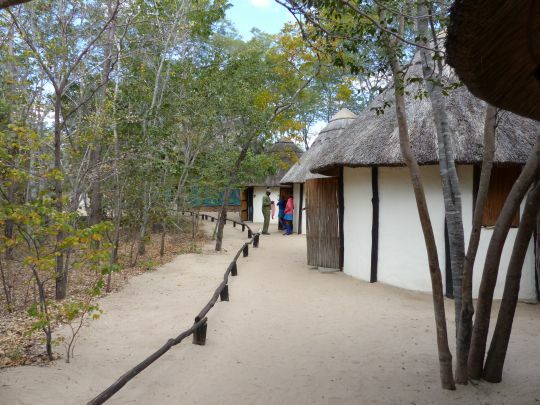 4-bedded huts and all meals are provided for the children and for many this is a luxury they do not get at home. We saw the children coming back from a nature walk and have lunch. In the afternoon we, along with some of the parents, watched their closing presentations. On arrival the children are divided up into 4 packs and each final presentation re-enacted something they had learnt during their stay. The children had clearly loved their camp experience and absorbed everything they had been taught. PDC’s investment in the future is that these children, who are the emerging generation, they will not set snares and will value their environment and endorse initiatives for the long term survival of Painted dogs. The end of our safari was co-ordinated to observe the commencement of PDC’s free bi-annual vaccination programme of domesticated dogs. We watched international vet Steve Leonard & his wife Cathy (also a vet), set up a mobile vets clinic under a tree at a local community centre and conduct castrationsand administer distemper and rabies jabs to domesticated dogs. A long line soon formed as more villagers brought their dogs to the open air clinic. Steve is Patron of PDC – ‘the most effective way of protecting wildlife from dog diseases is to eradicate it from the host population i.e. domestic dogs. Although there are huge numbers of them they are easily accessible and the impact on their welfare and the welfare of the humans that live with them is also paramount.’ Steve donates his time to this valuable cause and programme. Steve is also Patron of Wildlife Vets International and works in his own small animal veterinary practice. The work that PDC does has a real chance of infiltrating into everyone’s homes and changing whole community’s attitudes and lifestyles. The scale of their operation and the level of commitment and dedication is very impressive. It is one of the finest models of practical conservation I have come across. It is well established and respected by the local communities and deserves full endorsement and as much support as one is able to give. Pack animals have a complex and highly sophisticated social structure. 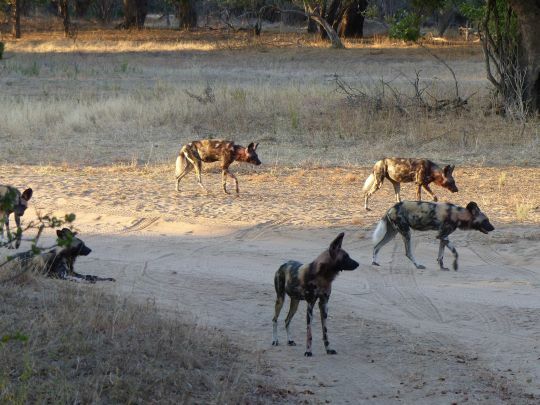 Observing them in the wild is immensely rewarding and Painted Dogs are high up on the list of pack animals. This was a safari that had a positive impact on all fronts for all of us. We love the dogs and the work that Peter and Greg and their teams are doing for the long term survival of the species. 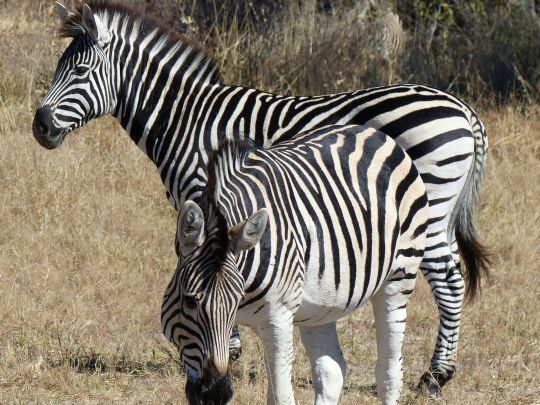 As safari’s go this was an extremely focused one – a ‘wild card’ safari, but we also saw masses of African wildlife, we did some of the best bush walking ever and saw one the Seven Wonders of the World. 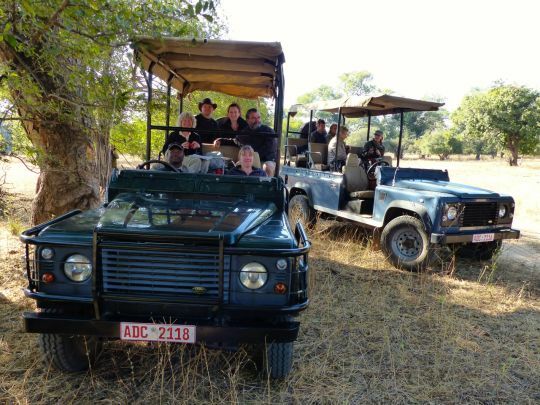 The highlights were the dogs, of course, but also traveling with 3 of the best experts in their specialist fields, which meant our experience went above and beyond the ordinary safari. We spent quality time with a leading research biologist, an international wildlife vet and a conservation director and witnessed first-hand their work. Thank you Greg, Peter and Steve. 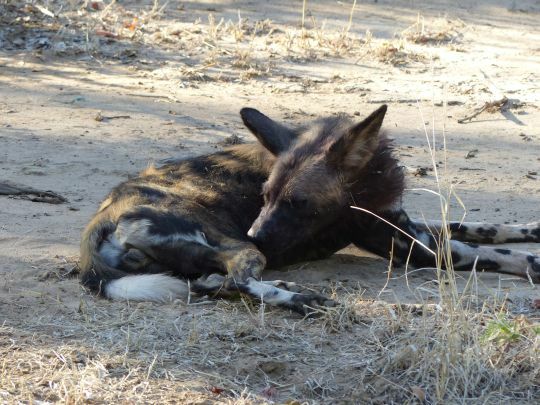 In addition to having a life-shifting experience, our participation on this safari actually financially benefitted the long term survival of Painted Dogs. What could be more satisfying than knowing the endangered species we’d come to Zimbabwe to see, benefitted directly from our visit? 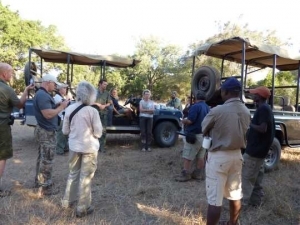 The vision for this innovative safari came from Liz Drake of Spencer Scott Travel, who put the programme together with Peter Blinston from Painted Dog Conservation and Dr Greg Rasmussen from Painted Dog Research Trust.